Staring at your recurring sales goals can be daunting for both a sales manager and the sales team. We get it. Our flagship program has generated hundreds of millions of dollars in new revenue for both domestic and international clients. At the core, our program drives top line revenue through a branded sales incentive program with a pay-for-results model. There is a reason our average client relationship is over 7 years. Our Channel Partner Incentive Program captures the attention of the channel partners in an engaging way to put your product line(s) top of mind and generate repeat orders. Driving targeted campaigns, new SKU launches, promos, SPIFFs, MDFs, niche manufacturer rebates, and volume incentives are all part of what we do and part of the E2 vocabulary. Understanding who your end consumers are can be a confusing path of awareness, interest, consideration, and conversion. The ability to mobilize the attributes of new consumers and their specific characteristics allows us to create a robust loyalty program, bringing those consumers back time and time again. Take charge on exceeding your sales stretch goals by creating an engaging sweepstakes program that pushes your sales and channel partners to break through the wall. Reward winning participants with the ‘power of choice’ when redeeming through our platform or let us handle the grand prize with an unforgettable experience to an event like the Kentucky Derby, Super Bowl, or the Masters®. Innovative within the incentive industry, E2 offers a Digital Debit Card through a partnership with Visa. Gone are the days where an incentive participant must wait for a physical card to arrive in the mail or keep track of it wherever they go. With the branded Digital Debit Card, participants can immediately redeem their rewards for instant gratification or allow their balance to grow for a bigger purchase. Participants go directly online to buy what they want, when they want it – the power of choice! With a traditional debit or gift card program, you pay out 100% of the amount of rebate or reward dollars issued – even if the participant doesn’t spend the full amount. With E2, you only pay for what is redeemed. Clients who have converted their loyalty programs to us have realized a 15-20% decrease in their overall program cost. We believe in a transparent pricing model in which you can directly attribute your dollars spent with increased loyalty, a pay-for-results model. E2 is a partner to your team and your success is in our financial interest. 1997 called and they want their catalog program back. We prefer to let participants choose their rewards and shop at the best possible price – if they are super shoppers with coupon or promo codes, they can use those as well. Say goodbye to 40% markups with limited catalog availability – Say hello to more options and a better experience with E2! It’s not about us. It’s about you and exceeding your goals. E2 is in your corner working behind the scenes to ensure the spotlight stays on your company. Branded sales collateral, digital communication, rebate web portals, and even our 24/7 support line will be in place to enable your success. To participants – we are simply an extension of your team. We have a friend, and a close friend at that. It’s our sister company, QuintEvents. QuintEvents has official ticket & experience packages to some of the most incredible sporting experiences around the world – The Kentucky Derby, F1® races, Super Bowl, UFC® VIP, The Masters®, and many more. Good news for you, we can get our hands on these packages providing a rare rewards experience for your key customers, top performing reps, or superstar employees. READY TO EXCEED YOUR SALES & PEOPLE GOALS? 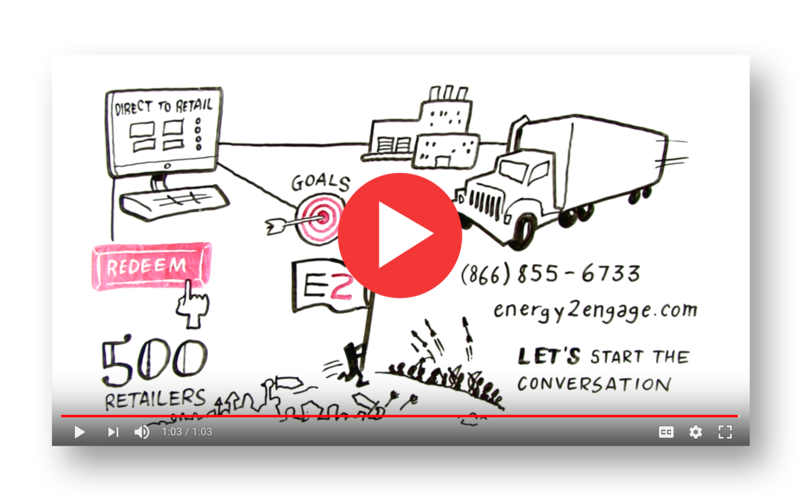 Energy 2 Engage (E2) delivers branded rebate, reward, and recognition programs through a pay-for-results model. Learn more about how you can exceed your sales and people goals! Contact us using the form below, and we’ll be in touch soon. Fill out the form and we’ll contact you with a time to chat! Energy 2 Engage (E2) is a loyalty company dedicated to helping businesses exceed their sales and people goals. E2 develops branded rebate, reward, and recognition programs using an exclusive digital debit card.